It's amazing how poorly some PCs are maintained. Amazing but not surprising. Here's what you can do to prolong the life of your PC and perhaps improve performance. When I purchased my Toyota Camry in mid-2012, I was given a schedule of maintenance for pretty much the life of the car. They wanted it in very 5,000 miles, with varying levels of overhaul at set intervals. For example, at 30,000, 60,000 and 90,000 miles, the car should get a heavy maintenance check, while every 5,000 miles is an oil change. Airlines do this with their planes as well. They have a ranking of A checks, a basic check done once every 500 hours, to a D check, which takes up to 20 days and inspects the plane down to its screws. Why, then, do people deploy a PC and then never once check the thing until it goes ka-boom, by which point it's probably too late? February 10 is National Clean Out Your Computer Day, where you are encouraged to give that machine a good scrubbing inside and out. Not in a literal sense, of course, although one of the recommended steps is to blast the insides clean. If you have a tower PC, take it outside to do this. A friend once did a cleaning inside his home, inhaled the fumes, and became deathly ill for several days. Open the case, stand with your back to the wind, and blast the daylights out of it with a can of compressed air. This stuff is sold in every store that sells PCs. Best Buy, Staples, you name it. Make sure to pay attention to the vents and cooling fans that blow out of the PC. They tend to be the most clogged. Get the heat sink fan as well and the entrances in the front of the PC where air is sucked in. Failure to clean a PC will inevitably lead to dust buildup, which causes fans to seize and lead to overheating. Those cans of compressed air are not for cleaning crumbs off your desk, they are for the PC. And don't breathe the stuff, whatever you do. Also don't shake it, and it you use it a lot, you'll notice the can gets very cold. Put it down for a while and let the contents settle down. For laptop users, it's a little easier. Just give the keyboard a nice blast to get rid of food particles and check under the case to see if any dirt is in there. In my experience, most laptops do a good job of keeping food and dust to a minimum. It's easy to dump a file on the desktop until your desktop is completely full of icons. This is a great way to slow your PC down, especially if it's a low-end PC. Start by getting rid of every non-essential icon on your desktop and putting it in a folder. Your PC will speed up from this because it doesn't have to refresh all those icons. Next, Windows 7 users should go into the Start Menu -> All Programs -> Accessories -> System Tools and run Disk Cleanup. It will present all the junk files you should remove. It will be backup files, crash dump files and temp files from Internet Explorer, all of which can go. If you have Windows 8, just start typing "disk cleanup" from the Modern UI and it will automatically find the app. Then you should manually look at every folder and see how things are organized. People toss files and folders around the PC, thinking they will get to it later, and later never comes. Move files around, and if you can, move them off the PC if you are pressed for space onto a backup drive, cloud storage or a thumb drive. All of the system maintenance utility vendors will be in full promotion mode between now and February 10, so it might be a good time to hunt for a bargain. For starters, you should do a deep virus scan. All of us have antimalware installed on our PCs that do a quick scan on startup. But deep scans are not common because they are intrusive and slow a PC down drastically. Launch your antivirus program, set it to do a deep scan, and go to lunch or leave it running overnight. There are many good utilities to clean up a PC, but online services like DoubleMySpeed.com and PCMatic.com have been found by reviewers to be effectively worthless. You need a locally-installed utility to do the clean-up job for you. I have two favorites. First is CCleaner, which is free. 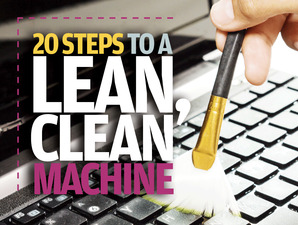 It will clean your PC of everything from junk files to tracking cookies. It's accurate and doesn't destroy necessary files, which some utilities are known to do. Second is System Mechanic, which has a 30 day free trial. It's a bit more comprehensive in that it can optimize the PC for maximum speed by tweaking internals, along with standard features like scheduling regular maintenance of the PC. You can find a whole bunch of recommended links at the official website, along with other PC management tips, like cord management. You wouldn't drive your car without checking the filters from time to time. Clean your PC once in a while so you can avoid this.